J'aurais une grande maison si j'en avais les moyens. I would have a big house if I could afford it. Would you have a light? Elle aurait cinquante ans aujourd'hui. She would be fifty now. Nous aurions froid sans nos manteaux. We would be cold without our coats. Vous auriez de la monnaie? Would you have some change? Ils auraient de la chance si cela arrivait. They would be lucky if that happened.. The je form has the same pronunciation as in Futur Simple. Look for the context : I will have vs I would have ! Is the pronunciation of j’aurais and j’aurai identical in French spoken in Canada? I thought that some regions -ai = é and -ais = è. 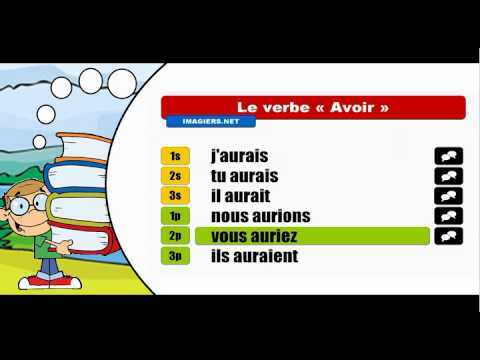 The lesson shows us "mangeons-en" and I know that "allez-vous en" is a valid sentence. Both are imperative. Why the difference in construction? Why is it not "mangeons-nous en" or "allez-en"? It is just that "allez-vous en" is an idiom or there some underlying graammatical rule? Yes I see. Thank you. i had several instances where tapping normally would not go to second question but increased tapping bypassed it altogether so I got a not completed score. Why is that? Hi Johanna - I'm not quite following what you mean. Could you expand and provide a little more context? Thanks. I had answered the first of the two quiz questions and tapped Next. Nothing happened. I tried again. Nothing. By the time i tried it a third time, it bypassed the second question and treated it as i submitted the quiz with only one question answered. Hi Joanna, we're not aware of any general issues with the MicroKwiz so will have to look into your specific set up. I'm going to transfer this to our helpdesk so we can better track the issue this area is better for language questions. "J'aurais une grande maison si j'en avais les moyens"
Why is the imparfait "avais" used here? "Could" is conditional, so why are we not using "pourrais" here? I could hear Robert play the flute in the next room. Mozart could play the piano blindfolded. I could leave work early today as I had a doctor's appointment. In all these cases 'could' can be replaced 'was able' or 'was allowed' in the last sentence. I would have a big house if I was able to afford it. French follows its own rules, and translating from English 1:1 won't always land you on the mark. Si tu veux tu peux le faire. -- If you want, you can do it. Si j'ai de l'argent, je acheterai une voiture. -- If I have money I will by a car. Si j'avais de l'argent, j'acheterais une voiture. -- If I had money, I would by a car. Si j'avais eu de l'argent, j'aurais acheté une voitre. -- If I had had money, I would have bought a car. I hope that helps, -- Chris (not a native speaker). That was a nice breakdown and it made a lot of sense. Thank you! They would be lucky: "ils auraeints de la chance"
I saw the avoir verb used here: "ils auraeints de la chance." Why not use etre ("would be"): Ils seraient de la chance. Is it a rule that the avoir verb always used with luck versus the etre verb? i believe so. « Avoir de la chance »= to be lucky. I don't really understand why "en" is used in this example, even after having reviewed the lesson you mention. Where does "de" come into it? "If I had a house", for example, would be "Si j'avais une maison" - not "Si j'en avais une maison, surely? In this case, the use of "en" seems to be rather random! Bonjour Martin ! Could you please send me the sentence you're referring to? I'd be happy to assist :) À bientôt ! Here it's because the full expression would be "avoir les moyens de [faire quelque chose]" = to have the means to [do something]. J'aurais une grande maison si j'en avais les moyens. In this sentence which is the meaning of "en"
if it is "some" I think I need "a lot"